The Emsisoft Emergency Kit offers a collection of tools to help you detect and remove malware from an infected PC. 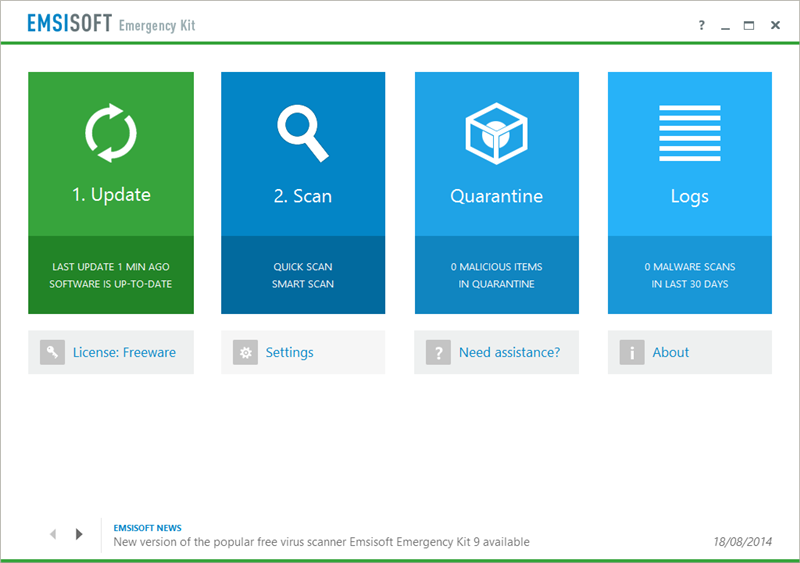 The suite includes the Emsisoft Emergency Kit Scanner, which will quickly scan your PC to uncover more than 4 million known threats. A command line version of the scanner makes it very easy to create batch files that will customise exactly how the detector works. If these utilities don't do the job, then Emsisoft HiJackFree allows you to investigate the system manually. You're able to view active processes, drivers, services, Windows startup programs, open ports, host file entries and more, helping you to spot any brand new threats that might have breached your PCs defences. Removing these dangers can be difficult, unfortunately: malware uses all kinds of tricks to protect itself from deletion. But that's why Emsisoft added BlitzBlank to their Emergency Kit. This useful utility is able to delete files, drivers and Registry entries at boot time, before the virus has loaded, so bypassing any protection it might employ and ensuring your PC will quickly be restored to normal. What's new in v2018.6 (see the changelog for more)? Giving this a thorough test run on a testbed with purposeful infection with malware, including a nasty keylogger that acts like a rootkit, it picked out most things straight up. However, files hidden in the actual file system are not picked out, making it less effective against deep infections and rootkits. My suggestion: perform a custom scan, and select "Use direct disk access" to find deeply hidden malware in addition to more easily traceable malware.